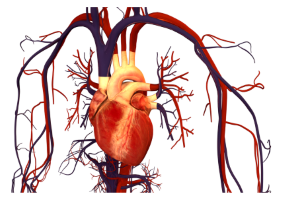 The cardiovascular system includes the heart and two networks of blood vessels: pulmonary circulation, which moves deoxygenated blood from the heart to the lungs, and returns oxygenated blood back to the heart; and systemic circulation, which carries oxygenated blood from the heart to the body's tissues and returns oxygen-depleted blood back to the heart. Blood is that sticky, red fluid which circulates throughout the body in a complex network of veins and arteries, transporting nutrients and oxygen to the body's tissues and removing waste products for disposal. The heart's contractions work to move oxygen into the blood; it also gathers carbon dioxide from the blood so it can be expelled through the lungs. While the lungs play an important role in this process, each of the body's cells is involved. The cardiovascular system includes organs which take up space throughout the body, including the heart and all of the body's veins, arteries and capillaries. The cardiovascular system is basic to life and the beat of one's heart is an automatic function which is controlled by the brain. For older people and people with serious heart disease, start with a small amount and increase gradually to the recommended amount, e.g. : Tri-Antioxidant: 1 tablet, 1 time/day, 3-5 days later, 1 tablet, 2 times/day can be taken if there is not adverse effect. 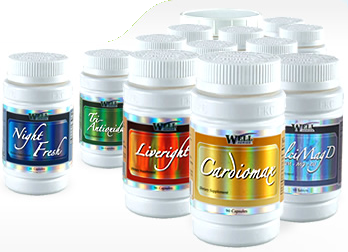 Since the FKC products are food supplements, the dosage can be adjusted according to one’s own condition. For patients with high blood pressure, medication should not be stopped at once after taking FKC products. High blood pressure may eventually case Arteriosclerosis, cardiac-cerebral-vascular diseases, which will cause serious problems. Customers with bleeding issues should NOT take Tri-antioxidant.